The Conservatives have taken control of Brentwood Borough Council in Essex for the first time since 1991. The Tories also held Southend, unseating a Labour councillor who had represented the ward since 1963. But at Castle Point, the Tories have lost four seats to members of the Canvey Island Independent Party. The Labour Party also lost one ward in Castle Point to the group. The Conservatives now hold 35 of the council's 41 seats. There is one independent member. Bernard Jenkin, Conservative MP for North Essex and shadow secretary of state for the regions, said of the Brentwood result: "I think it shows that we can turn the tide and the tide is turning. "We haven't been in control in Brentwood for a long time. "We were optimistic, but I think we won it by a bigger margin than we anticipated." Before Friday morning, no one had been in overall control of Brentwood, but the Liberal Democrats were the biggest party with 18 seats followed by the Conservatives with 16 and Labour third with three. The Tories changed the political picture and now have 21 seats compared with the Liberal Democrats' 13, and Labour's three. A significant win for the Conservatives was in the Brentwood West ward, where Liberal Democrat mayor Shirley Howe lost her seat on the council. Bob Russell, Liberal Democrat MP for nearby Colchester, said: "After 12 years it is disappointing for a lot of hard-working Liberal Democrat councillors. "But I have no doubt that the Liberal Democrats will revive and return in Brentwood. "Across the country the Liberal Democrats are driving forward. There will always be the odd blip." 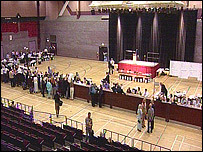 In the election for Southend-on-Sea Borough Council, the Conservatives held power. The Tory Party gained one seat, independents gained one seat and Labour lost one seat and the Lib Dems lost one seat. The new council is made up of 33 Tories, nine Labour members, seven Lib Dems and two independents. In the St Luke's ward, Reg Copley, former mayor of the borough who was first elected in 1963, was beaten by Tory party candidate Melvyn Day.